Great quality and colours. They are so soft and light. So far so good! 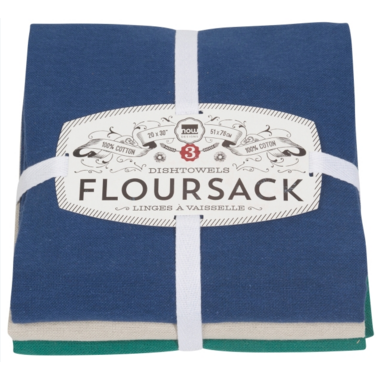 I do not understand how these dishtowels get so many great reviews. They are awful! So pretty and they come in lots of great colours but that is it. They are thin and do not absorb at all. I had to wipe quite a lot just to dry a container that had come out of the dishwasher. I won't be buying these again. Also, if you are thinking 'at least they'd look pretty hanging in my kitchen', they won't. They are really wrinkled when they come out of the dryer. You'd have to iron them to have them looking pretty again. LOVE LOVE LOVE these towels. The material is wonderful: sturdy but lightweight as well. They are awesome and absorbent so good for drying dishes and hands. I would suggest giving them a wash before their first use since this will help them dry better (maybe it opens the fibres making them more absorbent???). Great colours and I've had multiple sets and the colour stays true even after many washes! I love these towels! Great material and washes beautifully. I've been buying them for years and so glad to see they are now coming in different colours. Great quality towels. Wash well.